Kraang! Kraang! Kraang! A fist pounds on metal, deep underground. Somewhere on Earth, a monster in green clothing pounds, deep underground. Finally, the holding cell bursts, and the beast lumbers up to the surface, fist in the air. Fist in the air, high above Metropolis, Superman patrols. Keith, a youth from Suicide Slum, buys glow-in-the-dark spray paint with the hopes of attracting Superman. The monsters from Underworld, Clawster among them, are taking over a power station with their war machines, and Keith is privvy to their plans. Charlie, a miserable looking man in a trench-coat, seems to be their erstwhile leader. Lois Lane, checking her mail box, finds a note from "a friend" detailing the plans. She takes off, leaving Clark an email warning him as well. In a field, far off, Doomsday holds his hand out in the peace, and a bird lands in his palm. He closes his hand and pulverizes it. Clark arrives at the Daily Planet and checks his email. Before he can read it, however, a power surge takes out the lights, and the tech. The Underworld denizens celebrate, raising their weapons to the sky. Lois, on her tip, sneaks into the underground power station to find out what's going on. A sound in the dark alarms her, and she kicks out, only to find Clawster's hard skin hurting her foot. The Underworlders tie her up and hold her captive. Keith witnesses the scene. He is upset, because the Underworld people told him that they had his mother, and she is nowhere in sight. Keith takes the glow-in-the-dark paint and paints a giant S to attract Superman, which it does. Keith tells Superman about Lois, and about the Underworld army. Superman arrives on scene, just as Underworld is attacking. Rambeau lobs a grenade, "diversion seven", which Superman tosses in Clawster's mouth, knocking him out of the fight. Superman grabs one of the Underworlders, throws him up against the wall, and demands Lois. But the frightened being says that she's surely dead. Elsewhere, Doomsday knocks down a large bridge, tossing car after car to a fiery explosion. Superman bursts through a wall and grabs Charlie, finding Lois alive. He's about to punch Charlie out, but Lois stops him, telling him that Charlie was the mole. Story - 5: This is the first comic I read as a kid, at least the first since I stopped treating them like fodder and started collecting, and reading them seriously. That's an automatic five, because this issue singlehandedly drew me back into the format. Looking at it now, years in the future, I might give it a four. This is just for how the Underworlders seem so easily taken out. But that's the point of this story, after all, just showing Superman, doing his every day lah-di-dah thing, never suspecting the beast that looms over the horizon. I think that the writers must have made these villains pale in comparison to Doomsday on purpose. Also, Doomsday is nice. The story is taking its time, which is exactly what needs to be done to axe Superman. Art - 4: A few unnecessary splash pages, but nice contrasts, and some wonderful depictions of action. For instance, Superman flying up across from Doomsday, Superman throwing things out of the way like only Superman can, and Superman speaking with his hands. Hard to do in a comic, and it is done here. Cover Art - 5: Representative of a point of the story, no misleading gunk that could very easily be fallen to with a storyline such as this. For instance, a big, dead Superman in a city with a bunch of people looking at him. Now which is more exciting to the potential consumer? The last one. But which is more sincere and respectful to constant reader? The first. Booster Gold and Maxima (in this story and at this point in time a member of the Justice League) pull workers from a burning plant. Guy Gardner uses a yellow fire extinguisher to put out the flames. Ice, Bloodwynd, Fire, and Blue Beetle are also on scene. Meanwhile, and throughout the following, Superman appears on the Cat Grant show. 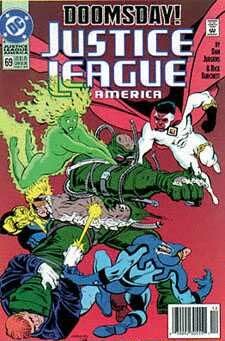 In the Blue Beetle's... well... flying Beetle, the Justice League pursues the source of the fire, Doomsday. It's not that difficult. All they have to do is follow the trail of fallen trees, fire, and death. Bloodwynd and Maxima try to scan the creature's mind. They find nothing but death and blood lust personified. Doomsday, in another place, stops in the woods. A deer sniffs his palm, and he grabs it, snapping its neck. The Beetle arrives, and Doomsday casually tosses a tree through it, downing the vehicle like a fly. The League pulls itself together and gets the non-flying members to the ground before finding out what hit them. Meanwhile, Doomsday, with one punch, takes out a freeway full of cars. With one hand tied behind his back. Literally. The League attacks in a full-scale frontal assault. Doomsday doesn't even blink. He grabs Gardner, slams him face first into the road, now splintered, and then punches him in the back of the head. Doomsday picks up Gardner by his face and slams him to the ground. Gardner's eyes ask anyone around to kill him. He's got a bruise that covers half his face. Fire blasts Doomsday. No effect. Bloodwynd pulls Doomsday into his fist, calling upon the spirits of the dead, hitting as hard as he can. No effect. Doomsday launches him through a natural gas dome, which explodes. Bloodwynd is on fire. Doomsday grabs Blue Beetle, gives him the Guy Gardner treatment, ripping him halfway out of his uniform and taking him out of the fight. Perhaps out of this plane of existence. Bloodwynd, now no longer aflame, tries to catch Beetle before he lands on the ground from the height that Doomsday has thrown him. Doomsday grabs Bloodwynd and pummels him into Maxima. Superman, at the Cat Grant show, has heard about the monster and opts to leave. Ice, taking care of Beetle, worries that he is already dead. Booster is obviously upset, and attacks. Doomsday's hand is now unclothed. His skin is gray, and bony protrusions from his fist are now apparent. He knocks Booster into the sky, out of sight, out of continent. Superman catches Booster, and asks who's attacking. Booster says that he doesn't know, but it's like Doomsday is here... huht...huh huht. Story - 5: Last line aside, this issue can't be done justice by my review, because of the way that the art and the story coincide. Superman gives an interview throughout all of the action above, and it is quite coherent, despite the difficulty of that, and the threat of Doomsday is made very real by the efficiency with which he decimates the league. Gardner is humbled. Beetle is beaten. Booster, well, I mean, anyone could take out Booster... but you know... it still says something. Just kidding. Art - 5: Very nice. Little touches make this one. The way that Doomsday snaps a neck. Gardner using his extinguisher upside down. The splash at the end that is actually necessary to show the scope of the scene, that is used appropriately. Cover Art - 4: Very cool looking, but the lack of a background is annoying, though it enhances the action rather well. Maxima and Ice examine Beetle, finding him beaten nearly to death. Ice wants to take him to the hospital. Maxima demands that he dies a warrior's death. After careful influence, Ice convinces Maxima to rush Beetle to a hospital. Ice dashes after Doomsday, who in the interim of taking care of the injured and sheer surprise over the decimation of the league has disappeared. Meanwhile, a young boy on a skateboard who goes by the name of Mitch (later a superhero in the Supermen of America book) skates home after school to his household, where his single mother feeds their youngest, a baby. Mitch comes home and complains bitterly about the baby having everything and him not having soda. Ice (the hero, not the drink addendum) flies through the window and crashes into a wall, ending the boy's whining. Doomsday takes their car out front and crumples it with one hand. The other hand is still bound. Booster Gold and Superman fly down, Booster telling Superman that this is the beast that decimated the JLA. Superman looks to Doomsday, arrogant, and says, "What was it you called him, Booster?" (flies down and stands to stare Doomsday point blank in the face) "Oh yeah" (Doomsday punches Superman in the stomach, hard, with no reaction from Superman) "Doomsday". Doomsday, enraged, kicks Superman through a house and a tree with a sucker-kick. Doomsday knocks down a tree with Booster's head. Doomsday goes into the house and attacks the family. Superman flies in and knocks him about, saving the family. The rest of the League arrives, and Superman commands them to pour all of their respective heat, ring, ice, and spiritual visions into the creature in the hopes of wearing it down. They burn. On and on they push, but Doomsday isn't even swayed. Gardner can't even see, but he keeps pouring it on. Fire falls over, exhausted. Booster's power cells run out. They stop. Surely he's down, right? Now his hand is free. Doomsday flies into the League, taking people down left and right. Superman is a bit worried. Doomsday takes Booster, slams his head in a car door, and throws his crumpled form to the ground, knocking Guy Gardner away with the throw. Punching both Bloodwynd and Superman at the same time, Doomsday knocks Bloodwynd's eye beams into the house's remains, setting it on fire. The flame reaches one of the gas pipelines in the house, and the house explodes with everyone safely out of the way except Mitch and his mother. Doomsday leaps away, very Hulkishly. Superman bolts after him. There is no one to save Mitch and his mother, for the JLA is out of commission. Superman is caught between taking out Doomsday and saving the innocent. Story - 4: A bit of rehash with the JLA bit. The JLA was taken out very well in the last issue, and shouldn't necessarily have bled into this one. But several establishing things were brought about with their presence: even more we see Doomsday's resilience, his strength. We see that even with the League there, Superman is the only one to handle the menace. I'm torn as to whether or not they should have been there. But even so, the teasing of Doomsday's identity, his body, his look is nice and slow, it doesn't leave the reader with too much or too little for this point of the story, and Mitch is later utilized in the books not to an amazing end, but to an appropriate one, and so I don't think Mitch and his family are just a waste of space. A good story. Art - 5: When I was a kid, I thought that it would take a heck of a lot for me to believe some creature, dumb or smart, could take out Superman. The art in this issue is the one that made me start to believe, when younger. The beams hitting him with him still standing, the way he knocks a car about, slams Booster in the car door, etc... just great stuff. I love Jurgens. Cover Art - 5: Representative of the issue and just darn cool. Doomsday, standing through the barrage, Superman and Guy giving their all. Just neat. Suffers from the same lack of color in the background as the last one, but somehow still pulls it off. Same scene. 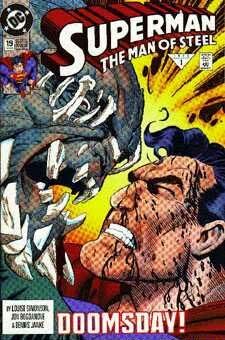 Superman follows Doomsday, torn. He smashes the heck out of Doomsday, sending the beast reeling, then turns to go back. Doomsday blind-sides him. Superman grabs him and sinks him to the bottom of the body of water they are near, then leaves to save Mitch's mother, now the only one caught in the blaze. Superman does just that with Bloodwynd's help. Medical personnel arrive. Guy berates Superman to give him the incentive to take the creature out. Bloodwynd teleports out of the situation. Superman leaves to chase Doomsday, now out of the water and attacking a helicopter. The helicopter is destroyed as Superman arrives on scene, stopping a missile they'd launched. He saves the pilots and smashes Doomsday down again. Doomsday lands in front of a police station. Superman lands on top of Doomsday. The car nearby explodes, but they keep fighting. Another chopper arrives, (you'd think they'd have learned the first time) another chopper is obliterated. Superman saves the pilots, and drops them off. Meanwhile, Maxima arrives and pops the monster a good one. Lois tries unsuccessfully to get Jimmy Olsen out of Turtle Boy taping sessions to go on assignment. She bursts in, grabs Jimmy, and they leave. Lex Luthor II watches with his girlfriend Supergirl on his lap (Long back story. Trust me.). He stops Supergirl from saving Superman to use her as a contingency plan for Metropolis. Doomsday's still standing after Maxima's pop. Maxima, angry, knocks him through a supermarket. Superman berates her for doing so, but Doomsday's already out and attacking again, dropping a van on Maxima, sending gas all over the place. Maxima grabs a light pole to swing, but it ignites the gas, knocking everyone but Doomsday out. Guardian arrives a few seconds later and revives them, but Doomsday is gone. Story - 3: It's keeping with the action of the story, but it seems kind of stuck in. I think Maxima belongs, but the podunk town seems out of place, especially since there don't seem to be any people in the supermarket. But still, the level of intensity is nice and the strength of character portrayal is very in key. However, the whole Turtle Boy mess and the Lex cameo, which should have been done an issue ago, are out of place. Art - 3: I've always liked Tom Grummet, he's been my favorite Superman artist save Jurgens and McGuinness for a while now, but this issue, in retrospect, was a bit odd for me. Some of the characters looked the same, some of the flight looked a bit strange. But the story was told, through pictures, so I guess I can't complain too much. Cover Art - 3: Representative of the action, but kind of silly looking. It's like, hey. I'm Superman. I'm running out of options. Let's use... my head! Yeah. Heh heh... uhhhh. Thpppt. Instead of "back-of-me-hand, beast! ", it's "back-of-me-head!". Chapter Five: ...Doomsday is Near! Superman, revived, takes off after Doomsday, despite being alone. Guardian takes Maxima to the hospital. Doomsday takes a semi and knocks it apart. A bridge soon follows. He takes a car and launches it into the air, high into the air. The occupant, still in one piece, is scared out of his gourd until Superman catches the car and gently sets it down. He sees that Doomsday has beaten him into a Lex Mart, and is inside, killing and destroying anything in sight. Doomsday sees an add on a TV telling people to come to Metropolis to see a WAR! the next Saturday at a wrestling match. Doomsday is intrigued, and grunts the word "Metropolis", as if he understands. Superman arrives, and blasts Doomsday outside. Lois arrives in a helicopter and starts to cover the scene. Lex convinces Supergirl to stay... again. Doomsday uses a car to knock Superman into a diner. Superman takes a minute to get up. Doomsday sees a Metropolis road sign, recognizes it, and starts heading that way. Superman punches him hard, trying to stop Doomsday from heading in that direction. He knocks him though the air, into a mountain. A mountain which just happens to house the Cadmus tree city. Director Westfield is knocked on his rear. They fight through the experimentation, destroying it in the process. Now Cadmus troops are involved. Guardian arrives on the scene. 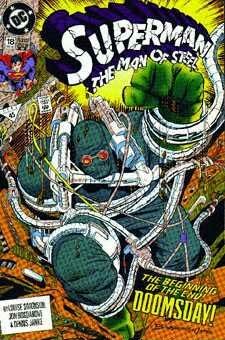 Doomsday takes a huge trunk of the tree city and brings it down hard, knocking both Guardian and Superman out. Doomsday takes off for Metropolis. Story - 3: I love the fight in the supermarket, and how Doomsday arrives at the conclusion that he needs to go to Metropolis. You've gotta know, coming into this, that Superman has to die in Metropolis, but you have a brainless automaton doing the killing, so how to get there, how to get there... good handling. But the better part of the issue is spent with the same old BIFF BAM SOK! in Cadmus, just to give Cadmus its part in the story. Unnecessary. Thus the three. Art - 3: I wasn't so impressed with the art here. Superman seemed a bit gawky, as did everyone else, and there are pieces of the art that just seem missing, details left out that the inker should have got to, mostly. Cover Art - 5: Very cool, very representative, and a nice pose. I don't buy into the statue craze, of late, but this little cover would make one that I would consider buying, and I'm a hard sell for those kind of things. Chapter Six: Doomsday is Here! Doomsday lands on the outskirts of Metropolis and brutally kills two construction workers. Superman slams into him with all his might. Now the gloves are off. He pulls Doomsday high into the air, then flies him all the way down to the ground again, but Doomsday is too agile and escapes. Dubbilex scans the creature's mind and finds nothing but anger. Superman is now bleeding from the mouth. Clark's parents watch in fear on the television. Doomsday bursts down into Underworld and frees the characters from the first story, inadvertently. One of them thanks him, and Doomsday squishes him. Superman arrives, grabs Doomsday in a full nelson, and takes off. Doomsday snags a power wire, and a city block explodes, knocking both apart. Supergirl, seeing this, finally attacks. Superman gets cut deeply by Doomsday's elbow prutrusions, and is thrown from the fight. Supergirl laughably attacks. One punch from Doomsday turns her into a protoplasmic sack of gray goo. Bibbo and Emil try to shoot a big laser at the creature, but Doomsday, having been thrown by Superman high into the air, lands on the building, causing them all to jump. Special belts Emil has passed around cushion their fall. The SCU attacks, but Turpin is thrown impossibly far. Superman catches him. Doomsday attacks Superman, cutting into his sides. Superman knocks bone from Doomsday's chin. Cadmus troops arrive and start blasting. Story - 4: Lots of cameos detract from the action, but the action itself more than makes up for it. Lots of motion, lots of pain for the Man of Steel. A definite plus is seeing Supergirl, who wouldn't fight, get taken out so quickly and brutally. Art - 4: I was never really fond of the Man of Steel art that Bogdanove did. All of my compatriots seemed to think it amazing, but it never impressed me, because it was too reliant on motion and action for me. But this is an issue based in that type of action, so here it works superbly. Cover Art - 2: Big heads. Cheesy expressions. Super Friends reference: Must... fight... evil. Doomsday: Smell... my... breath... That's the dialogue I get from this. 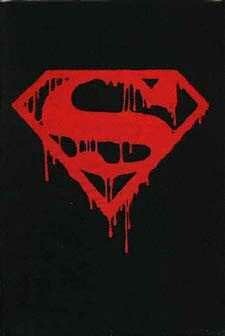 Though seeing blood on Superman is just spiffy. Not because I wish him harm, but because it shows his vulnerability. Not really much story... mostly art... splash pages all the way through. 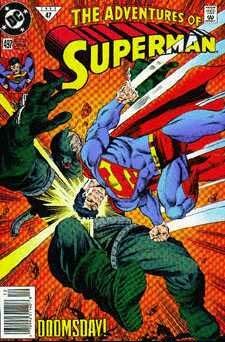 Superman and Doomsday pummel, punch, attack each other. Doomsday downs Lois' helicopter, and Superman saves her. In some hidden rubble, he tells her that he'll always love her, and then flies back in to down Doomsday. They continue to exchange blows, flying through buildings, into cars, through people. Jimmy takes pictures. Lois reports into a tape recorder. Superman uses his heat vision. Doomsday knees Superman in the chin with a bony protrusion, cutting him. Superman is bleeding all over. He snaps off a few bony extensions from Doomsday, and they wind up for one last ditch attack. 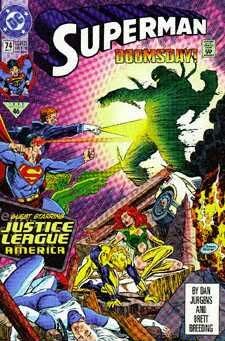 The world watches as Superman and Doomsday blast each other at the same time. Doomsday collapses and dies. Superman is cradled by Lois. "Is he dead?" Superman asks. "Yes." Lois says, crying, knowing what is coming. Superman lies back and dies. Story - 5: Whoo. My review can't do this story justice. Too much going on with too little words. But it does what it needs to do... it effectively kills Superman, and but good. No Justice League, no Cadmus, well, a little Cadmus. No supporting character convolution. Just Supes and Doomsday duking it out to the finish. Perfect. Art - 4: While the entirety of this story was told through splash pages, which normally I abhorr, it doesn't bother me here. In fact, if Superman's death were told in anything but a splash page format, I would whine. It's too big a story for anything else, scope-wise. I give it a four because of a few pages that did little. Otherwise, it's beautiful. Especially the death scene and the heat vision blast. Cover Art - 3: For all of the hype and memories this cover draws up in my mind, it's basically, when you look at it, a pretty crummy, pretty dull cover. And Superman doesn't really lose his cape where he falls. He loses it long before. The high and mighty might suggest symbolism and chastise me, but that's okay. I hate symbolism. So there. It's cheesy. And it bugs me. Story - 5: There were minor deviations from the organization of the idea, IE the death of Superman, but all in all, I would say that in this case DC took the nearly impossible and did it with a flourish and a gusto. 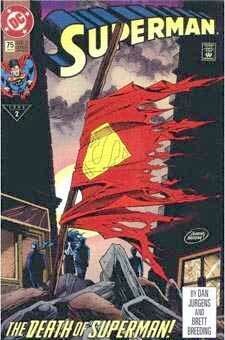 The series brought me back to comics, the series killed the Man of Steel. The series probably saved Superman as a character. Five of five all the way. Art - 5: Harping on the individual issues is easy, but keeping up the continuity and the destruction without turning this into a campy Batman episode of BIFF BAM SOKs must have been immeasurably hard, and the team did it, and did it well. Again, five of five all the way. Covers - 4: Most were phenomenal. The last one was atrocious, and the Justice League one needed help, but all and all, darn near flawless. Cover of the Trade Paperback - 1: Cheesy, weird, and covered with names. Ugh.